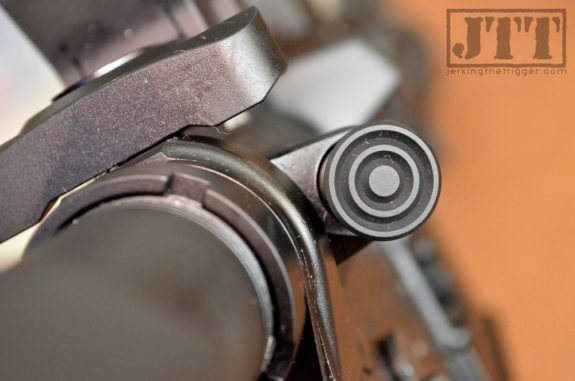 The AR-15’s forward assist has long been a topic of debate among shooters. Some shooters seem to think it is absolutely necessary. Some think it’s unnecessary or even dangerous. On one hand, I get the arguments for the user of the forward assist for administrative functions like cleaning up after a “press check” or for the sake of reliability since it gives the ability to chamber a round that otherwise did not chamber on its own. On the other hand, the other side says you probably shouldn’t chamber a round that wouldn’t chamber on its own and there is already an assist built into the AR-15’s bolt carrier (the chamfered cut that allows the shooter to push the bolt forward with their thumb). I understand both sides and occupy the middle ground, generally considering a forward assist to be nice to have but not necessary. Honestly, I don’t really think about it much unless I am rifle shopping/building. Where do you stand on the AR-15’s forward assist? 3 Responses to Forward Assists – Necessary, Unnecessary, or Disaster Waiting to Happen? I too am in the middle on this one. I don’t hate a FA, but I do use them from time to time. I have several uppers where the FA is pinned on (Vltor MUR) and there is a way to remove and have it slick, FA-less. I prefer to keep it as-is. I can tell you where the FA does come in handy. After conducting weapons maintenance in the patrol base or a similar place and you need to load a round back in the chamber, but stay quiet to avoid detection. As for the FA breaking and causing a malfunction. I’m sure it happens from time to time, but I can honestly say I’ve seen more people hit by lightning then broken forward assists causing malfunctions. I agree. Pretty nuetral on the forward assist. The bolt angle doesn’t sell to me because 1. Bolts get hot. 2. It’s harder to manipulate a bolt than to just smack a forward assist. Honestly, I spent 11 years in the Corps and have owned/shot ARs for many years. I can’t remember actually having to use the forward assist or bolt to fully chamber a round. I do like the idea that it’d be useful when doing a quite reloading.